FiberTite is proud to be a Sapphire Sponsor for this year’s Florida Roofing & Sheet Metal Expo (FRSA). The convention will be held June 28–29 at the Gaylord Palms Resort & Convention Center in Kissimmee, Florida. Representatives will be on hand in booths 525–527 to discuss the temporary roof membrane, designed for flat or sloped commercial roofs, that protects damaged roofs until permanent repairs can be made. 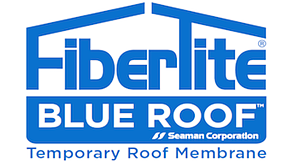 FiberTite Blue Roof can be used as a temporary roof for tear-off areas or new construction. It offers UV-resistant performance for up to one year and fabric reinforcement that provides tear and puncture resistance. As the largest regional show of its kind, the FRSA convention is three full days of networking and education and two days of trade show. Exhibit hours are Thursday, June 28, from 11:30 a.m.–5:00 p.m. and Friday, June 29, from 10 a.m.–3:00 p.m.
For more information on all the sports tournaments, receptions, seminars and networking events planned, visit the official convention website or download the convention brochure.